Chair of the ACT Heritage Council David Flannery believes light rail will herald a new era for Canberra, just as the introduction of a train line did for Goulburn, John Thistleton writes. David Flannery admires the exceptional workmanship in Goulburn’s 1869 brick piers, built for the first railway line into the town. “These early bricklayers were true artisans proud of their trade,” the Canberra architect and urban planning researcher says. The piers construction coincided with the start of Goulburn’s golden era of grand public buildings. They reinforce Mr Flannery’s view that light rail will similarly propel Canberra into a new era. Architect and Chair of the ACT Heritage Council Mr Flannery is a long-term champion of light rail. He is aware of transport’s relationship to planning, most especially the impact cars had on Goulburn and Canberra. Canberra is full of planning commentators but few have articulated as consistently as Mr Flannery the insidious nature of car-induced urban sprawl, particularly in the territory’s new northern suburbs. Observing Goulburn over recent decades, he said the Hume Highway had once turned the heritage city’s main thoroughfare into a car sewer. The earlier arrival of rail had a far better impact. “When rail arrived in 1869, Goulburn was already a prosperous town based on agriculture, I guess, and the arrival of rail guaranteed ongoing prosperity of the town,” Mr Flannery said. Mr Flannery says when Canberra’s first stage of light rail is completed, and the network becomes citywide connecting the town centres and airport, the national capital will flourish. “Strengthened development will happen in those transit corridors. Hopefully it lessens the amount of land grab that happens because of urban sprawl, that we have more inner city development,” he said. He says Canberra is one of the least dense cities in Australia. “The distance from the top end to the bottom of Canberra, from Bonner to Banks, is the same distance as the crow flies, just over 42km, as it is to Bondi Beach from Blacktown. But Sydney has 10 times the population. Graduating from the University of Sydney as an architect, Mr Flannery worked for the NSW Government Architect in Sydney and Newcastle before arriving in Goulburn for 18 months. 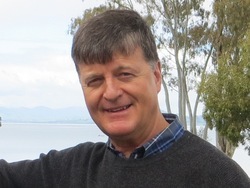 He lived in Goulburn from 1981-82, when Australia’s busiest highway had turned the main street into a “car sewer”, before moving to England for postgraduate studies in conservation of the built environment. He took slides to show an audience of international fellow students a history of architecture in Goulburn. “I have had a fascination of the life and culture and history of Goulburn ever since that time,” Mr Flannery said. The dominance of cars since the 1950s changed transport and planning in Goulburn and Canberra. Mr Flannery says the highway bypass in 1992 was built not before time and relieved Goulburn of congestion. A keen photographer, he had trained his telephoto lens from one end of Goulburn’s main street to the other before the highway bypass, capturing the predominance of commercial signs all trying to out-do one another and catch the attention of passing motorists. “These days with the town returning to a greater awareness of its built heritage, it has tried to tone down the prominence of commercial advertising in the main street,” he said. 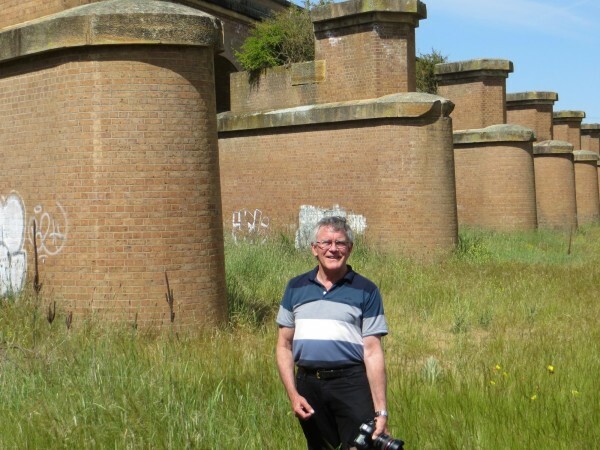 Pictured above is David Flannery, the Chair of the ACT Heritage Council, at the site of Goulburn’s early rail infrastructure. Its construction coincided with a golden era, similar to the potential growth on offer from light rail in Canberra, the architect argues. Photo: John Thistleton. If London Bridge (one of them) could be moved to Arizona, then perhaps Canberra could have some of those lovely 1860s brick piers to get the tram over the Lake. And with state-of-the art transport infrastructure, we could also then aim to replicate Goulburn’s former claim to be the largest producer of chenille in the southern hemisphere. Moving a London bridge to Arizona makes more sense than building a light rail to nowhere in Canberra. I’d really like to see David Flannery take a strong interest in improving rapid buses to the outer suburbs of Canberra. Not a very trendy issue at the moment, but buses do help many people, and some areas will not get light rail soon. Weekend “blue” rapid buses to Kippax would be good, they currently go every 15 mins from Tuggers to Belconnen on weekends, and should be extended to Kippax, where they go on weekdays. Of course, light rail is a more fashionable topic, but I think the Liberals gave rapid buses more attention. Perhaps David could drag himself to the outer suburbs and try to catch a bus on the weekends- not much fun at the moment. Again Tuggers is a town centre, Kippax is a group centre. And buses in West Belconnen are actually as good as anywhere else in Canberra. So give the poor old neglected West Belconnen thing a bit of a rest, it isn’t so poor. And light rail unless you want Southern Cross Drive and Belconnen Way lined with 4 story apartment buildings ain’t going to happen. However Flemmington Road and Northborne Ave, yup that is why it is a ‘popular’ topic for the government. JC- You say you have lived here since the late 1970s. Perhaps you feel defensive of West Belconnen, as you grew up here, or have lived here for so long. When people come here from “the outside’, they can clearly see that there are facilities and services lacking in the area. One Labor MLA told me that West Belconnen is the poorest area of Canberra. Perhaps you don’t want to see this, but others can see it clearly. So, I am trying to improve it. Why not try and improve it? It would be nice if the ALP-Greens governments tried to improve it too…We live in hope. I hope you can try and improve it too, why not improve a neglected, poorer area? What have we got to lose? Until we meet again, cheerio. Wanting improvement is one thing, claiming West Belconnen lacks facilities and comparing facilities that are found in town centres and saying Kippax should have them is false. Kippax doesn’t need a swimming pool as there is one in the town centre (and Bruce). West Belconnen has sufficient schools to suit its needs, though I don’t agree with the K-10 school in Holt. West Belconnen has sufficent shopping facilities (and with Charnwoon and Kippax better than a lot of places in Canberra). West Belconnen has good roads, though yes a few black spots, again like everywhere else in the ACT. In fact I really do struggle to find anything found elsewhere in Canberra that is missing from West Belconnen that should be placed in West Belconnen. And yes I know how poor parts of West Belconnen are. I grew up in public housing in Macgregor (off Handcock Cres) and Charnwood were my local shops. I saw and lived it every day. As a statutory office holder, is Flannery paid by the ACT Gov’t ? He who pay the piper plays the tune. Anyway, the whole premise of this article is wrong and is not an apples-to-apples comparison. “Light rail will propel capital into new era as train did for Goulburn : heritage chief”. Really ? Goulburn has heavy rail and is on a main line. When/if ever completed, Canberra will have a commuter light rail between its town centres. Hardly the same. From the OP : ” Mr Flannery says the highway bypass in 1992 was built not before time and relieved Goulburn of congestion. “. Funny about that, if u densify Canberra, road congestion will increase – as is detailed in the ACT Govt’s Benefits Costs Ratio document. So, revealing congestion in Goulburn via a highway bypass is not relevant to the tram in Canberra. There is more in the partisan/biased OP and Flannerys alleged comments that could be commented on – but suffice to say that the OP and Flannerys alleged comments, adds nothing to the tram issue as it relates in Canberra – except to add to the spin that Canberra voters have proven they are influenced by. As a statutory office holder, is Flannery paid by the ACT Gov’t ? He who pay the piper plays the tune. Anyway, the whole premise of this article is wrong and is not an apples-to-apples comparison. “Light rail will propel capital into new era as train did for Goulburn : heritage chief”. Really ? Goulburn has heavy rail and is on a main line. When/if ever completed, Canberra will have a commuter light rail between its town centres. Hardly the same. I had to laugh! Where is Goulburn now? A historical relic and an economic wasteland without the railyards. Fine if you like the “quiet” lifestyle. And lightrail = development, which means pulling down all those things that David wants to save. I have to look no further than Balwyn, Melb. Lovely old buildings ripped down to build 10 storey apartment blocks and McMansions. It seems appropriate to have a heritage advocate touting the benefits of trams in this day & age. Drag Canberra kicking & screaming into the 1890s! Electric trams were originally brought in to eliminate the problem of horse manure in the cities due to their reliance on horse transport (500 tons a DAY) in Melbourne for example. There are far faster, cheaper, more convenient modern transport systems now coming on line which should have been utilised. I really thought the horse manure problem was solved but here we go, it is coming up again. And the alternative solution being touted is autonomous cars, which can have their heritage traced back to Mesopotamia in 3500BC. David Flannery estimates that up to three quarters of the people who use buses on Flemington Road and Northbourne Avenue will switch to other modes or routes, rather than use light rail. This may result in Canberra’s light rail being consigned to “heritage” sooner than even Mr Flannery expects. These estimates are included in “Greenhouse gas emission reductions from Canberra’s light rail project,” Steffen, Percival and Flannery, Australian Planner, 2015. If what you report is true then Mr Flannery needs to explain why he supports light rail on one hand and says it will be shunned by 75% of potential users on the other. I cannot see a conflict in preserving heritage buildings, encouraging density and development. Indeed development is needed to re-purpose old buildings. To get the growth in the right places, decisions must be made about transport, and so far in Canberra’s case investment has favoured cars, as it has throughout NSW. Am I the only one who is worried by Flannery’s comments? This guy is the Chair of the ACT Heritage Council, which makes decisions on whether to protect particular buildings – mostly in the older (ie, most established) parts of Canberra. But he espouses views that are pro-development, and pro-density, which are only economical in the inner (ie, older and more established) parts of Canberra, where the buildings most eligible for heritage are. So on the one hand he leads the circle of decision on whether to refuse permission to demolish, but on the other he supports development and believes demolition necessary. Conflict much? Or maybe that was why Barr chose him. David Flannery is right to promote heavy rail and this is what Canberra needs, not Light Rail. Compared with Sydney, Canberra stretches from Hornsby to Heathcote. Can you imagine Sydney without its Metro heavy-rail system? Light Rail looks very pretty but even Sydney is realising it can’t do the job of mass public transport. Someone in Goulburn suggested extending Canberra’s Light Rail to Goulburn, not understanding it has a max speed of 70 km/hr. The XPT trains are about 35 years old, the Explorers 23 years old. Replacing them with trains which don’t break down, have air-conditioning that works and travel faster on straighter tracks will bring more patronage. Even the ageing trains are being used more these days by Canberrans tired of plane delays at airports, and car queues on the F5 Freeway tunnel. The NSW Government is upgrading (slowly) the XPT fleet because it too recognises this will increase patronage and ease road congestion. The improvements you have noted are indeed desirable but but there are huge costs involved in upgrading rail infrastructure and this would necessitate commensurate increases in fares. The existing Canberra – Sydney bus services are very competitively priced and (I will get criticised for saying this) the Canberra – Sydney Explorer service is over-weighted with concessional fare paying passengers who will scream loudly if there is any attempt to take away their entitlements. The Explorer train services unfortunately do not include Sydney Airport on their route either. Events like this will propel Canberra into a “new era” also. Mr Flannery’s proposal for the Civic to Woden light rail line in the Canberra Times before Christmas crossed over 64 road intersections, meandered through suburbs and had four sharp right angle turns. It would triple the time taken for public transport to get from Woden to Civic and would cost an absolute bomb in physical build and a squillion in land acquisition. The article would relate better to Canberra Light rail, if it looked at the terrible impacts on the town and community that ill-informed and poorly planned project funding decisions by the Goulburn Council had on the city. Yeah, that Civic to Woden tram route suggestion would have required the tram driver to take a compass and cut lunch and have several comfort stops along the way.